What is to be done when your two best buds share a birthday? You plan a party for them to share, whether they want to or not, of course! This is what happens up in VIP Heaven every single day. All the glorious divas and class acts and famous historical figures continually share the spotlight (which actually might be VIP Hell, now that I think of it) with their birthday brothers and sisters. But you know that Mae West would be able to make the most of it. 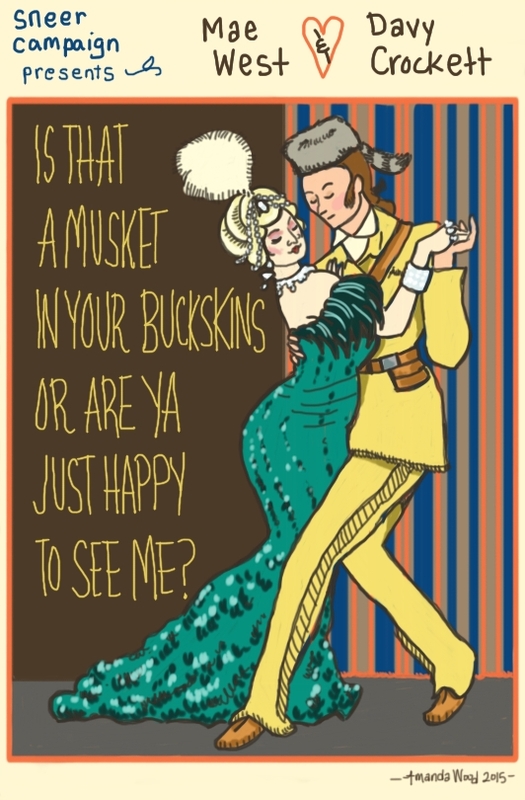 I have drawn her engaging in a dance and typical maewestian banter with my noble ancestor, David Crockett. Happy Birthday to these superstar icons!